I made the ham version. The ham bits nicely balanced the slight bitterness of the small tender dandelion leaves. As I hungrily devour the dish, I can almost feel the nutrients surging through my body. I’ve made it through another winter. Spring (and fresh food) have arrived – and I know that the summer’s bounty will be here soon. Life is good. Thoroughly wash the dandelion. (I triple wash it, and it is a slow process. The washing of the dandelion is what takes most of the time when making this recipe.) Put in a large sauce pan and cover with boiling water. Place on stove, bring back to a boil using high heat. Boil for 15 seconds then remove from heat and drain thoroughly. 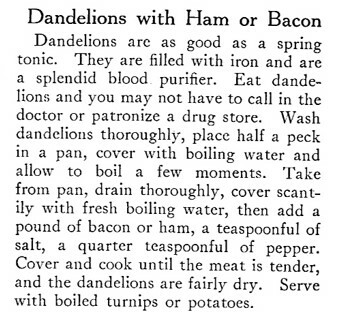 Just barely cover the dandelion with fresh boiling water, add ham or bacon, salt, and pepper. Cover and place back on the stove. Return to a boil using high heat, then reduce heat and simmer until the meat is tend and the dandelions are almost dry (they should still have a little juice (about 25 minutes). Remove from heat. If desired, serve with boiled turnips or potatoes. Posted on April 7, 2019 March 16, 2019 by SherylPosted in FoodTagged dandelion, recipe. Wow! I thought my family was the only one out there digging up “weeds”. This sounds similar to our recipe, but what do you mean by “dry” leaves? Ours never really got tender, sort of like kale when cooked…can’t wait to try this version. Spotted some dandelion flowers already (it has been so cold here, that surprised me) Do you only use the greens on the plants before the flower has bloomed? If memory serves, we kids were told to look for the greens but not the flower…thanks in advance! It’s good to hear that your family also enjoys this wonderful foraged green. Near the beginning of the cooking process as the leaves wilted, there was a fair amount of liquid in the pan. The liquid begins to evaporate when cooked a little longer. I decided that the dish was done when there was just a little remaining liquid, and I didn’t need to drain it (and lose nutrients). I assumed this was what “fairly dry” meant. I only use the greens before the dandelions bloom. The season is so short – and that probably a reason I enjoy dandelion so much. The leaves get more bitter as they get larger and the dandelions bloom – though they can still be eaten. This sounds delicious but I have no idea where to find dandelions around here. Haven’t seen those in years! It’s a shame you can’t buy them at the farmers markets or grocery stores. At least I’ve never come across any. It’s amazing that there aren’t dandelions where you live. There are so many around here. I’m guessing that any of the dark greens (beet greens, curly endive, etc.) could be substituted for the dandelion in this recipe. There may be some, but not in my back yard. We have every other variety of weed though! I always wonder which dandelions are edible. The ones down here look very different. Here’s a nice page that describes the Texas dandelion and some of its uses. Since registering for your emails, I find delight in EACH and everyone! This one in particular, really tugged at my heartstrings. My Grandparents raised me and they were both born in the late 1800’s, immigrating from Sweden and Finland. EVERY Spring, my Gran would search out Wild Ramps and Dandelions, making a wonderful steamed dish that we devoured each early Spring. She’d boil them, then add a pat of good ol’ bacon grease from the drippings jar. They were a feast in themselves! I just wanted to let you know HOW MUCH I enjoy your blog on early America food! I’m glad this post brought back some good memories. Thank you for the kinds words. I have so much fun researching, making old recipes, and writing posts for this blog; and it’s wonderful to hear when someone enjoys it. This sounds wonderful! I must try it, I normally just toss the leaves into a Spring salad, I’d never thought of cooking them like turnip greens. Thank you! I think that you’d enjoy this recipe. We had some nice, soft rain all day yesterday…I’ll be harvesting dandies today!! You’ve reminded me how much I appreciate dandelion leaves. Time to get out there and forage before they get tall and too bitter. Thanks. The length of time that dandelions are at their prime for eating is so fleeting. I think that the short season is one of the reasons really crave dandelion as spring approaches. It is so different from many fruits and vegetables which are now available year round. I’ve never eaten dandelion greens. I’ve had dandelion wine, but no greens. I’m not sure how that could be considering my upbringing with foodie parents who tended to like old-fashioned foods. Especially any recipe with ham in it. Glad your new old recipe worked for you. You should give dandelion greens a try. I think that you’d enjoy them. We always made dandelion wine, but I’ve never eaten the greens. On the other hand, when I still had my pet squirrel, I’d forage for new leaves for him. The same cautions apply for humans and squirrels, of course: look for plants that you know are free of pesticides, fertilizers, and such. Roadside dandelions can absorb other pollutants, and should be avoided. Good advice. As with all food foraging, it is important to use a little common sense when harvesting the food. Loved this inspiration for the fresh spring bitter greens, and your version as well as the old version. I like seeing that “half a peck” is eight cups. Like hearing about you going out to get the dandelion greens. 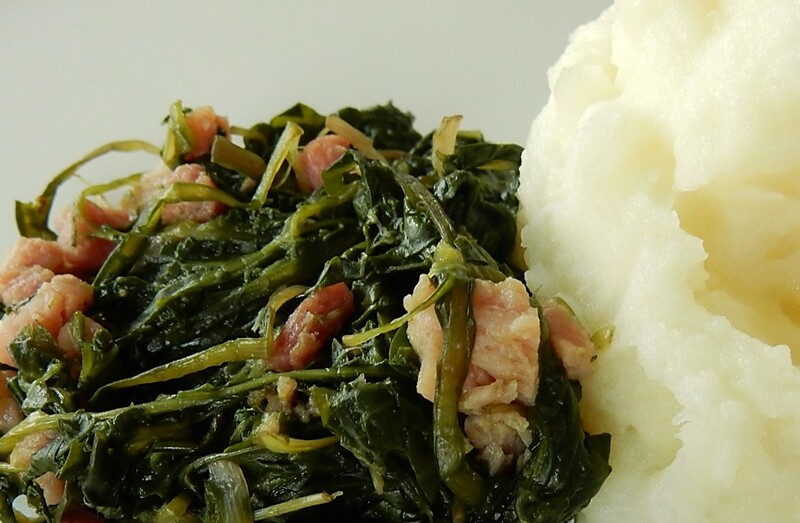 These greens are so good for us, and adding the ham makes it really tasty. It’s nice to hear that you enjoyed this post. The spring bitter greens are so nutritious. I’ve only seen dandelions in stores a few times. The ones that I’ve seen in stores were larger than the typical wild dandelions but tasted similar. I’m totally convinced that dandelions are an underutilized green. They are so tasty and can be used in so many ways. It’s wonderful to hear that you enjoyed this post. I had fun researching and writing it. Years ago we had tried to harvest dandelions when we had an abundance in our back yard. They weren’t very good and I suspected they weren’t the harvestable variety. But I think we might have picked them while they were in bloom. Anyway, this is an interesting recipe and I enjoyed reading about how you enjoyed them! Dandelions get very bitter after they flower. You should try them again, but harvest earlier in the season. The leaves are smaller then, so it’s time-consuming to wash them, but it’s worth the effort. This looks way more appealing than the way grandma used to make it with her hot bacon,egg dressing! The dandelion is going to turn bitter here with the warm weather we been having and will be having all week…. hope that hot front doesn’t bring any tornadoes! To tell you the truth, I also love hot bacon dressing on dandelion (and other greens). I just plain enjoy greens. 🙂 I’ll keep my fingers crossed that there aren’t any tornadoes. You have such a wonderful way of writing. I’ve never tried dandelions. Truly it would have been a celebration of surviving winter by picking the dandelions and other Spring sprouting vegetation that would give the body a new surge of vitamins and minerals and hope and joy. Today many fruits and vegetables are regularly transported across hemispheres, and we can buy them year round at almost any supermarket. A hundred years ago fresh foods were much more seasonal, and people really looked forward to the spring greens, strawberries in late spring, corn on the cob in late summer, and so on. Its awesome that the leaves of this plant are so rejuvenating when you eat them. Many weeds as we know them have curative and medicinal properties. Thank you for sharing this traditional wisdom. It’s nice to hear that you enjoyed this post. I’d like to learn more about the medical properties of weeds. You might be interested in this newspaper article on some weeds in Tamilnadu, where I live. We don’t have dandelions here, but there are other weeds that are as amazing! Thanks for sharing the link. It’s fascinating how some plants that are commonly considered weeds have medicinal value.